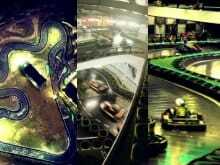 Touching down at a tourist information desk near you shortly will be the brand new Slideways Go Karting brochures. Chock full of all of the latest info from all three of our Brisbane and Gold Coast centres, they will get you up to speed before you hit the race track! Don’t forget we are open throughout the school holidays 7 days a week, with the indoor venues open 10am – 10pm, and the outdoor Go Karting World open from 9am – 5pm.